Martin-Misener, R., Blackman, S., Balkissoon-Grool, A., et. al. Presented at the Canadian Association for Health Services and Policy Research, May 2015. Listen to Ruth Martin-Misener describe this poster (1:24). Moher, E., Hogg, W., Johnston, S., et.al. Presented at the Canadian Association for Health Services and Policy Research, May 2015. Haggerty, J., Fortin, M., Loignon, C., et.al. 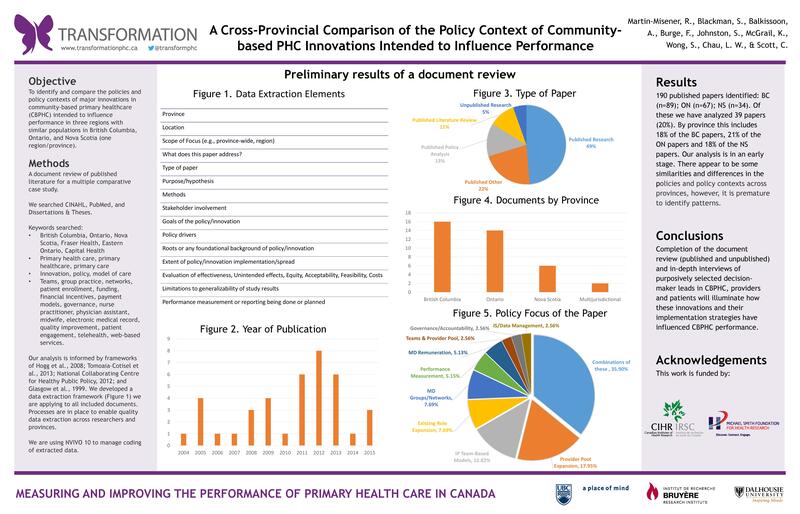 Forum presentation presented at the Canadian Association for Health Services and Policy Research, May 2015. Langton, J., Hogg, B., Sanmartin, C., et.al. Presented at the Canadian Association for Health Services and Policy Research, May 2015.